Doc continues to show improvement as we hear him wheeze less frequently, even climbing up steps. He has even done extremely well on the hot and humid days we have had recently. Each week that he continues on your EZ Breathe Support formula we are amazed at the change! So glad that we found your website! Dr. Pinky Pinkerton, the herbalist extraordinaries, would like the world to meet this handsome gent who is a whooping 17 years young.....BOWSWER says Dr. Pink, who is very impressed with Jessie's healthy stature and his wonderful owner Patti. So world, Dr. Pink thinks your probably wondering how does this dog do it? How has he stayed this healthy his entire life and what is he doing now to continue to stay so healthy and vibrant? Dr. Pinky Pinkerton is big on GRAIN FREE meals. Dr. Pink believes that grains are not a dog's best friend! What else does Patty do for this handsome gent? Patti gives him herbs for any of his old aches and pains! Patti has spent a huge amount of time learning the options that are there for all of us and that can keep our pet pain free and healthily. 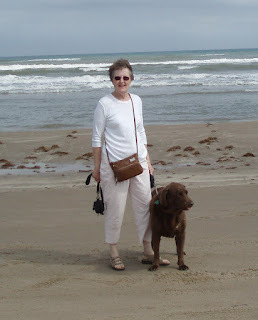 Patti is currently working with PawHealer.com to help Jessie with hind leg weakness. Dr. Pink Pinkerton expects Jessie to make it to the world book of records for the dog that lives the longest!!! Good job Jessie and Patti, Dr. Pink Pinkerton salutes you.